Experience Bone Broth - Katie Gaffney, OMD, L.Ac. Bone broth has been growing in popularity lately and there’s a good reason for it! When you cook bones for a long time, you release all the juicy goodness inside which is made up of cartilage, bone marrow, amino acids, and minerals such as calcium, magnesium, and phosphorus. Both the western world and eastern world agree bone broth has many health benefits, but for different reasons. For instance, westerners say the stem cells in the bone marrow are good for supporting immunity and they say cartilage supports joint health and improves inflammatory conditions. In Traditional Chinese Medicine(TCM), we say bone broth tonifies Qi and blood and boosts Kidney jing(or essence). It’s important to keep Qi and blood strong because they are the basis for every energetic system in our bodies. In TCM there is an important connection between bones and KD jing and so by ingesting the essence of the bones, you are boosting your KD jing. Jing is important because it a special source of energy that we are born with and diminishes as we age and can be burned out faster with poor treatment of our bodies such as with overwork, overpartying, lack of sleep, poor diet, and excess physical exertion. This is the kind of stuff we all do every once in a while so it’s important to help boost that jing whenever we can! If you’re wondering how to make bone broth, I’ve got some advice to keep it simple. 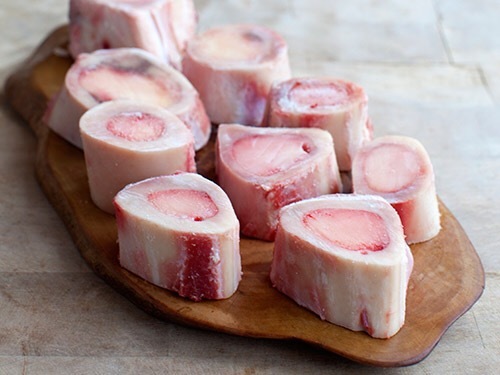 When I make it, I just buy some raw chicken legs and, when I’m lucky enough to find it in the meat department, I add cuts of beef marrow bones (pictured below). Put those in a crockpot with some veggies and herbs of your choice. I like adding green onion, garlic, ginger, and carrots. Then cover it all with water and let it cook all day or night for about 8 hours. When it’s done, just drink the broth like a soup one or two times a day. It’s especially a good idea to start your day with a cup of bone broth because it’s warm and easy to digest, so it’s a nice wake up call for your spleen. I usually make bone broth every few months when I’m feeling run down or when people around me are getting sick, but if you do it regularly you will definitely notice an improvement in health and energy. So if you have any kind of digestive issues or joint disorders, or low energy or if you are trying to recover from an illness, ditch the breakfast smoothie and make yourself a nice warm bowl of bone broth!